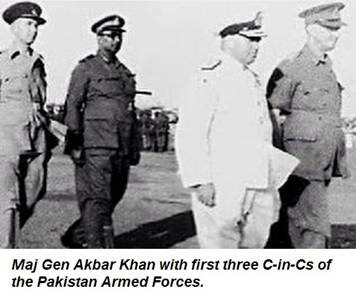 Major General Muhammad Akbar Khan (1897-1993) was the senior most Muslim officer at the time of independence in 1947. He was the son of Risaldar Major Fazal Dad Khan (1847-1943). Fazal Dad was a Minhas Rajput from Chakwal area. His family’s fortune was linked with Sikh durbar. After the demise of Sikh rule and emergence of British Raj, family recovered some of the lost fortunes under British patronage. Fazal Dad served with 12th Cavalry and after a long service granted the title of Khan Bahadur. He was granted a large amount of land by the British and had three estates in Montgomery (Sahiwal), Chakwal and Lyallpur (Faisalabad). He established a horse stud farm on one of his estate. Fazal Dad had cordial relations with senior British army and civilian officers. Commander-in-Chief Field Marshall Lord Birdwood, Archibald Wavell (later Viceroy) and Sir Bertrand Glancy (later Punjab governor) had close relationship with Fazal Dad. Fazal Dad married four times. Six sons of Fazal Dad Khan joined Indian army and all were polo players. 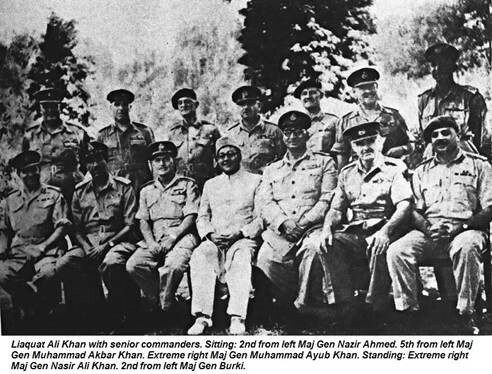 Five brothers of Major General Muhammad Akbar Khan served in the army. Major General Muhammad Iftikhar Khan was commissioned in August 1929 and joined 7th Light Cavalry. He was transferred to 3rd Cavalry when later regiment was Indianized. During Second World War, he served with newly raised 45th Cavalry. He was nominated as first Pakistani C-in-C. He died in 1949 in a plane crash at Jang Shahi before assuming the office. His wife and son also perished in the same crash. Brigadier Muhammad Zafar Khan was commissioned in 1934. He retired as Director Remount, Veterinary & Farm Corps (RV&FC). Brigadier Muhammad Yousef Khan was commissioned in 1935. He also retired as Director RV&FC. Brigadier Muhammad Afzal Khan was commissioned in 1935 and joined 16thLight Cavalry. Later he transferred to Royal Indian Army Service Corps (RIASC). Major General Muhammad Anwar Khan was commissioned in 1936 in the Corps of Engineers. He was the first Pakistani Engineer-in-Chief (E- in-C) of Pakistan Army. Two brothers didn’t join the army and settled in England. Muhammad Tahir Khan was a lawyer and settled in England. Muhammad Masood Raza Khan was the most enigmatic of all. He had BA in political science and MA in English literature from Punjab University. He was enrolled at Oxford. Although he inherited most of his father’s estate but he was ready to renounce his feudal heritage at an early age. He was an intellectual but psychologically disturbed. In an ironic twist, he made an appointment with a psychoanalyst when he landed in London but by mistake they thought he wanted to be trained as a psychoanalyst. He ended up a leading psychoanalyst of his times, highly respected by other professionals and made wide ranging friends from aristocracy, film and theatre. He lived in London and travelled widely giving lectures on psychoanalysis. Akbar Khan enlisted in the army in May 1914 and served with his father’s regiment 12th Cavalry. In July 1915, he was promoted Jamadar and served with the regiment in Mesopotemia. After the Great War, commissioned officer ranks were opened for Indians. A Temporary School for Indian Cadets (TSIC) was established at Daly College at Indore. Forty two cadets started a one year training course on 15 October 1918. On 1 December 1919, thirty nine cadets qualified but thirty three were granted King’s commission with effect from 17 July 1920. Of the six not granted King’s commission, three resigned, two found unsuitable and one died. Akbar joined new war time raised 40th Cavalry as Second Lieutenant. This regiment was raised in April 1918 by Lieutenant Colonel James Robert Gaussen D.S.O. of 3rd Skinner’s Horse. Ist Skinner’s Horse contributed one squadron, 3rd Skinner’s Horse two squadrons and 7th Hariana Lancers one squadron for 40th Cavalry. Final composition of the regiment was one squadron of Rajputs and half squadron each of Jats, Sikh, Dogra and Hindustani Mussalmans. Nephew of His Highness Agha Khan, Captain Aga Cassim Shah (originally from 3rd Horse) was one of the squadron commanders of the regiment at that time. In December 1920, Akbar was Quarter Master (QM) of the regiment. 40th Cavalry was disbanded in 1921. In 1921-22 re-organization, 11th Cavalry and 12th Cavalry were amalgamated and Akbar was transferred to 11th /12th Cavalry. This new amalgamated regiment was named 5th King Edward’s Own (KEO) Probyn’s Horse. Akbar served with 5th Probyn’s Horse from 1922 to 1934 and was regiment’s Quartermaster from 1927 to 1931. In May 1934, he transferred to Ist Battalion of 14th Punjab Regiment (now 5 Punjab Regiment of Pakistan army) and participated in the Mohmand Operation. He served as battalion’s adjutant. A year later, he was attached to the Royal Indian Army Service Corps (RIASC) to which he transferred on 5 February 1936 and served in Waziristan operation in 1937. His newly commissioned brother Muhammad Anwar Khan was also serving in Waziristan with 4th Field Company. In 1940, he went to France with Force K6 in France. He was second-in-command (2IC) of No 25 Animal Transport (AT) Company. This force was evacuated to UK and then returned to India. He later served in the Burma Theatre. He used the suffix of ‘Rangroot’ after his name highlighting his rise from the ranks. He was also known as Akbar Khothianwala and Akbar Khaccharwala due to his service with mule companies of service corps. 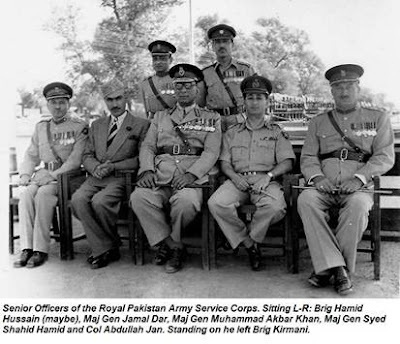 Photograph: Courtesy of Major General ® Syed Ali Hamid from the album of his father Major General ® Shahid Hamid. In April 1946, C-in-C Field Marshal Claude Auchinleck presided over a selection board. Several Indian officers were recommended for senior appointments to prepare them for command when British left. Akbar was recommended by the selection board to be Army Commander but it was probably to have a Muslim among the senior ranks of an Indianized army and not for professional excellence. Akbar was the only senior Muslim officer at Brigadier rank while the remaining six recommend for promotions and coveted postings were Hindus. Kodandera Cariappa, Rajindra Sinhji and Nathu Singh were recommended for army commander posts. S. S. M. Srinagesh was recommended for Chief of General Staff (CGS), Ajit Anil Rudra as Adjutant General (AG) and Bakhshish Singh Chimni as Quarter Master General (QMG). On 15 August 1947, Akbar was promoted Major General and appointed head of the formation called Sind and Baluchistan area. It was later re-designated Sind area and on 1 January 1948, it was re-designated 8th Division. Karachi sub area was designated 51st Brigade on 1 November 1947 and Quetta sub area re-designated 52nd Brigade in September 1948. 8th Division headquarter was in Karachi and in May 1948, headquarter was moved to Quetta. Akbar was in command during all these transitions. His Indian Army (IA) number was 90 and Pakistan Army (PA) number was 1 as he was the senior most officer of Pakistan army. He retired on 7 December 1950 handing over command of 8th Division to Major General Adam Khan. In June 1930, he was appointed Member of the Order of the British Empire (MBE). It is not clear why Akbar first transferred to infantry and later RIASC although he had good annual reports when he was serving with 5th Probyn’s Horse. Early in his career, his squadron commander wrote ‘a very capable young officer …. commands the respect of all the Indian ranks’. His commanding officer wrote, ‘Above the average in brains and energy …. keen on his work and good at games …. a promising Cavalry officer’. Other annual reports noted, ‘One of the most efficient King’s Commissioned Indian gentlemen I have met’ and ‘an officer of distinct ability who should take a prominent part in the process of Indianisation of the Indian Army’. Major General commanding at Peshawar wrote in his Annual Confidential Report (ACR),’One of the best of our Indians holding King’s Commission’. In 1946, Delhi area commander Major General Freeland wrote about Akbar ‘A level headed and most staunch officer. He is more of a commander than a Staff Officer. I have great confidence in him’. Extra Regimental Employment (ERE) with Frontier Scouts, Burma Military Police and RIASC carried additional monetary allowance. Indian officers were not posted to Frontier Scouts and Burma Military Police that left only RIASC for any Indian officer looking for extra allowance. The first Indian officer posted to Frontier Scouts was Lieutenant (later Lt. Colonel) Mohammad Yusuf Khan of 6/13 Frontier Force Rifles when he was posted to South Waziristan Scouts in 1937. Some officers who needed extra money transferred to RIASC (Lieutenant General B. M. Kaul as a junior officer had some financial troubles and decided to leave 5/6 Rajputana Rifles for RIASC). Akbar was from the landed aristocracy and financial difficulty was not the likely motive for him. One likely explanation is service consideration. For first generation of Indian officers, the dream was to end the career with command of a battalion at the rank of Lieutenant Colonel. Akbar was one of the first Indian officers to join a cavalry regiment. Cavalry was a British preserve and he may have concluded that it was not likely that he would ever command a cavalry regiment. Akbar Khan was among the early generation of Indian lads given commission as officers when officer rank of Indian army was opened to Indians in the aftermath of First World War. He was from a family that prospered under the benevolence of Raj. His father received large tracts of agricultural lands for service and in return family sent its sons to serve in Indian army. Acknowledgements: Author thanks Major General ® Syed Hamid Ali for providing many details as well as confirmation of many facts from family members of Akbar Khan, Muhammad Afzal; nephew of Akbar khan, Colonel Zahid Mumtaz for the details of careers of sons of Fazal Dad and Ghee Bowman; a PhD candidate working on his thesis on RIASC contingent in France and England for providing details of service comments in annual confidential reports of Akbar Khan. All errors and omissions are author’s sole responsibility. 1- Chris Kempton. Pack Mules from India, Force K-7 and Force-6. Durbar, Volume 29, No.1, Spring 2012. Akbar the junior- Akbar Khan (1912-1994) was a Pathan from Charsadda area of Khyber-Pukhtunkwa. He was from the pareech khel clan of Muhammadzai tribe that inhabits the village of Utmanzai. Akbar was from the last batch of Indian officers commissioned from Royal Military College Sandhurst in February 1934. Lieutenant General B.M. Kaul was his course mate at Sandhurst and they became friends during their service. Officers commissioned from Sandhurst were called King Commissioned Indian Officers (KCIOs). Akbar joined 6/13 Frontier Force Rifles (FFRif.). This battalion is now One Frontier Force (FF) Regiment of Pakistan army. He fought Second World War with 14/13 FFRif. (now15FF). This was a new war time battalion raised in April 1941, at Jhansi. In new war time raised battalions, officers and men were posted from different battalions, usually from the same group. Lieutenant Colonel Arthur Felix-Williams, DSO, MC of 1/13 FFRis. was the first Commanding Officer (CO). There were fourteen officers in the battalion and Akbar at the rank of Major was the senior most of the four Indian officers of the battalion. Lieutenants H. H. Khan, Fazl-e-Wahid Khan and A.K. Akram were other Indian officers (Wahid won MC). Battalion was part of 100th Brigade (other battalions of the brigade included 2 Borders and 4/10 Gurkha Rifles) of 20th Division commanded by Major General Douglas Gracey. Latif II - Muhammad Abdul Latif Khan (1916-1995) was from the princely state of Bhopal. He attended Indian Military Academy (IMA) Dehra Dun and commissioned in 1936 (IC-105). He joined 5/10 Baluch Regiment (now 12 Baloch). In Second World War, he won MC for gallantry in April 1945. He was the first cadet battalion commander of Pakistan Military Academy (PMA) at Kakul. His brother in law Major S. Bilgrami (two sisters were married to Latif & Bilgrami) was appointed company commander at Kakul at the same time. He commanded 5/10 Baluch from November 1948 to February 1949. He was commanding 5/12 Frontier Force Regiment (FFR) in 1949. This battalion is now 2FF. This battalion was part of 101 Brigade based in Kohat and commanded by Akbar. In February 1950, he was posted GSO-I of 9th Division based in Peshawar, commanded by Major General Nazir Ahmad. In December 1950, he was promoted to the rank of Brigadier and given the command of 52 Brigade based in Quetta. He was arrested in March 1951 along with several other officers for conspiracy to overthrow the civilian government.